SA Event Decor is a company that specialises in providing themed event decor for the Events industry. SA Event Decor provides function décor hire for corporate functions and events. With unlimited event décor ideas to select from, we can conceptualize and create the most impressive party designs including gala dinner ideas, centerpiece décor, table décor, backdrops, cut-outs, draping, lighting, glassware and furniture. SA Event Decor staff have good knowledge of many venues, lodges and hotels . 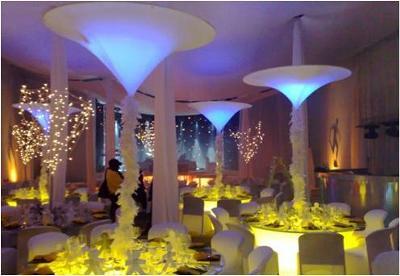 This enables us to provide themed decor ideas that are appropriate for your selected venue, offering you peace of mind. Our sister company SA Wedding Décor, managed by wedding décor specialist, Amanda van Dalen, offers spectacular wedding decor ideas. SA Wedding Decor has a large variety of décor ideas including a good range of luxurious linens, goblets, underplates, serviette and chair detail, centerpieces and a flower service. SA Event Decor and SA Wedding Decor have a variety of colors for draping. We can do any type of draping with fire retardant as stipulated by law. We have recently opened a new décor company to manage the dry hire section of SA Event Decor. Randburg Party Hire, situated on the corner of Malibongwe Drive and Oxford Drive in Randburg, can offer you any item that SA Event Decor stocks at dry hire rates. Randburg Party Hire stocks most party stock including helium balloons, tables, chairs, linen, backdrops, cut-outs and more. Our combined stock includes (but is not limited to): Backdrops, cut-outs, furniture, cocktail tables and chairs, draping, linen, serviettes, underplates, goblets , centre pieces, stretch shapes, stages, snow machines, LED star curtains and gas heaters. This website features a gallery of recent events, decor and themes. SA Event Decor Truck Hire - a new division within the company. We now have two new trucks in our fleet: an 8 ton Mercedes Benz and a 4 Ton Fusso. With our drivers knowledge of most venues, hotels and lodges within South Africa and neighboring states we can offer you hassle-free truck hire. The management team at SA Event Decor are very experienced and knowledgeable about cross-border events and will assist you with regarding the technicalities for the cross border events. Both trucks are rigged to pull normal 12 volt trailers. You can also hire a giant, 6X2.4m trailer for your event. All vehicles have SA Event Décor branding.